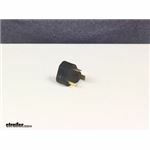 We have the part # A10-G30450VP which is a 50 amp female socket to 30 amp male connector. 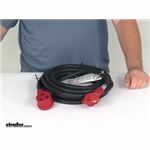 OK now for the bad news, in most cases when your 50 amp RV is plugged into 30 amp shore power you will have some limitations on how many appliances you can run at one time. If your RV is equipped with 2 Air Conditioners, you may only be able to run one Air Conditioner unit at a time. If you try to use both AC units at the same time you may pop the shore powers 30 amp circuit breaker. 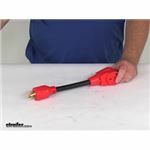 I believe what you are looking for is the Mighty Cord Generator Adapter Y-Cord # A10-G30420Y. 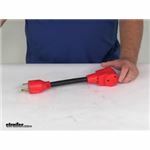 It converts a 4-prong 30 Amp outlet to two 20 Amp 3-prong outlets. 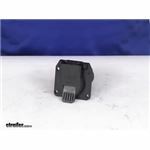 I spoke to my contact at Valterra and found that the # A10-5030FBK steps down a 50 amp service receptacle (2 X 120VAC) to 30 amps supply. 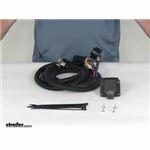 This would work great for your camping trailers electrical system. 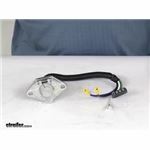 I have linked the above mentioned product to this page for your convenience. 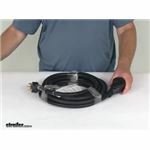 The Valterra Mighty Cord 50' RV Power Cord Extension w/ Finger Grip Handle - 125/250V - 50 Amp # A10-5050EH the hot wires are the 6 gauge and the ground is 8 gauge. 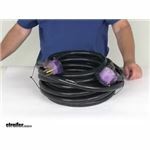 I confirmed this with the manufacturer for you, so you will have 3 wires that are the thicker 6 gauge and one that is 8 gauge within this extension cord. 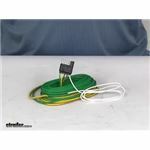 The part # A10-1530DVP will easily handle the amperage of the accessories you mentioned. 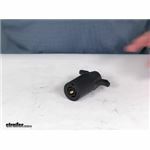 I attached a review video for this adapter for you to check out as well. 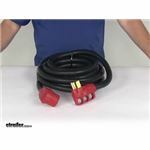 We have several different cords that could work for you starting with a 50 amp twist lock female to 30 amp male # A10-3050EHD. The cord on this one is 25 feet long. 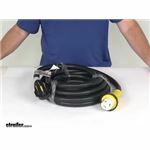 For a shorter option we have # CAM55582 which is 18 inches long but still a 50 amp twist lock female to a 30 amp male. 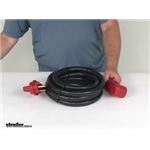 On your set up it sounds like the locking end is on the 50 amp on the house so if that isn't right let me know. 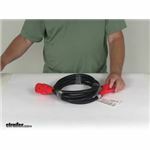 The Mighty Cord 50 Foot RV Power Cord Extension w/ Finger Grip Handle - 50 Amp # A10-5050EH that you referenced is designed for what you mentioned. 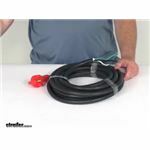 It is designed to be a 50 foot long 50 amp extension cable for RV applications like what you have. 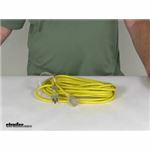 As long as you aren't exceeding the 50 amp rating of the cord you'd be good. 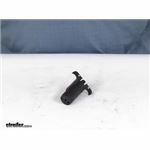 Sounds like you are looking for an adapter like the part # A10-1550VP. 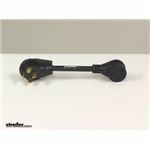 It has a 220 volt 4 prong type female end and a 110 volt male end. Check out the review video I attached for more info. 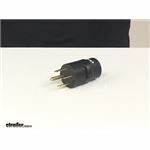 Instead of using two adapter the part # A10-1550DAVP would be a better option as it goes from a 50 amp twist lock female to 15 amp male like you need. 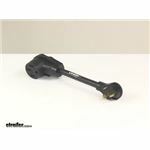 Of if you wanted a longer setup the part # A10-1550D90VP is 12 inches long and has a 90 degree elbow. 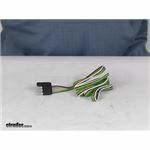 For a straight connector we have the part # A10-1550DVP. 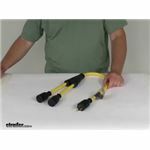 Three of the wires of the Mighty Cord RV Wiring Power Cord # A10-5025ED90 are 6 gauge and one is 8 gauge. 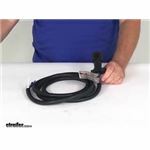 The Mighty Cord Generator Adapter # A10-G30430VP that you referenced is an L14-30 adapter as it is a 30 amp twist lock style adapter. L14-50 means 50 amp twist lock like the # CAM55572 which has both sides male and female this style. 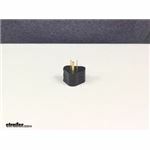 If you ran a 30 amp to 50 amp adapter like part # A10-G30350VP you'd need to use it with 125 volts and not 220/240. We have just what you are looking for. 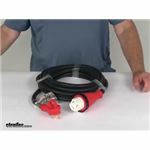 The part # A10-1530DVP will plug in to the 110 receptacle of your generator and would give you a 30 amp female connector for the RV to plug into. 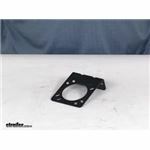 Sounds like you are looking for something like the Mighty Cord Replacement RV Power Inlet # A10-50INVP which is designed for 50 amp twist lock connectors. We don't have just the door for this though. 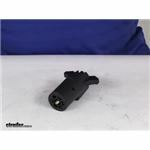 For 30 amp twist lock we have the part # A10-30INVP. 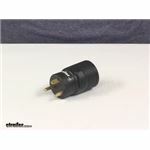 It sounds like you are looking for an adapter cord with a 4-prong 50-amp female twist-lock connector on one end with a 3-prong 30-amp male on the other. 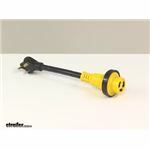 Such an item is Camco Power Grip # CAM55582. 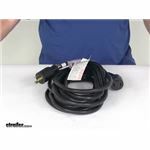 I linked our entire range of RV power cords and adapters for your reference. If you need something else please send us photos of the two connectors you need to join. 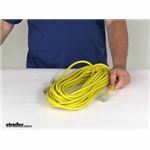 The linked chart shows common electrical connectors which are labelled to help you identify which you have. 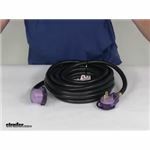 The Mighty Cord 90-Degree Detachable RV Power Cord # A10-3025ED90 referenced in your question will work with your 2011 Rockwood Signature Ultra Lite 8280 Trailer as long as it has 30 amp service. 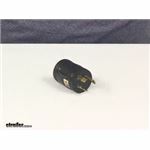 This is most likely the case for your trailer, but you will want to check to ensure that is correct. 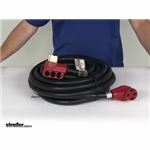 A larger trailer will sometimes need 50 amp service, in which case you would use the Mighty Cord # A10-5025ED. 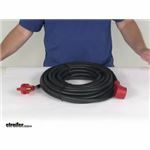 The Epicord 30 Amp Twist Lock Power Inlet # 277-000138 has it's own waterproof cover. 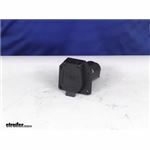 The Weatherproof Cover w/ Threaded Ring # A10-30CV is designed to fit a Twist Lock 30 amp connector like the part # A10-30FDT. 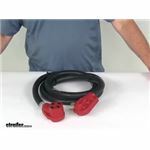 Along with your Mighty Cord 30 Amp Twist Lock RV Power Inlet # A10-30INVP you can use their mating replacement female Twist Lock Connector # A10-30FDT. 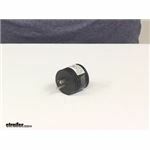 If you care to add a weather-resistant locking ring you can also use part # A10-30CV. 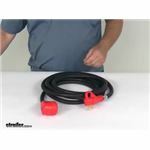 We have many RV-to-generator adapter products that are shown on the linked page. 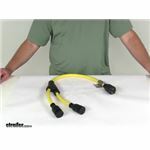 These come in varying lengths and with many different connector fittings. 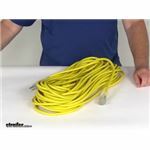 If you click on the type of fitting you need for each end, both generator and adapter ends, you will then see just the items that will work for you. 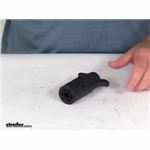 For example, for an adapter with a 50-amp female on one end and a 4-prong 30-amp male twist lock on the other you can use # CAM55422. 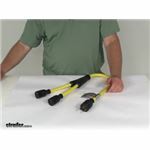 Do You Carry A 50 AMP Power Cord In A 10 Foot Length? 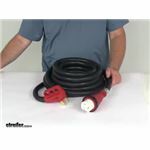 The Mighty Cord Detachable RV Power Cord - 50 Amps - 25' # A10-5025EDBK is the shortest 50 amp cord available. 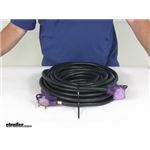 We do not have a 10 foot length available, however, I do have another option for you. 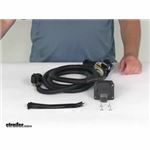 You can use the Mighty Cord 10' RV Power Cord Extension w/ Finger Grip Handle -125/250V - 50 Amp # A10-5010EH along with the Power Grip Marine-Style Power Cord Adapter w/ Handle - 50 Amps - 18" Long - Locking Ring # CAM55552. We do not carry the recepticles you are seeking. 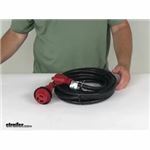 To convert from the 30 amp 110 volt services to the 50 amp on your trailer you can use an adapter plug like the Mighty Cord # A10-3050DAVP. 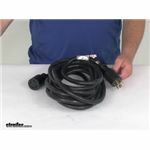 Or if you need a cord we have # A10-3050EDBK which is a 25 foot cord with a 30 amp male and 50 amp female.